that will be available from Superdrug in April. From looking at the images the range is going to be quite large with items like eyedust, clear mascara, glitter eyeline and pressed powder. In Superdrugs own words 'There's no getting away from the fact this is the best priced cosmetics collection available in the country'. I'm personally looking forward to this new budget friendly line - I feel when makeup is this low in price you can really try out colours and items you wouldn't normally. If you want to read my other post with more images of the new MUA range just click here. Ooh I'm looking forward to checking this out when it's in store! I love cheap make-up for experimentation with colours etc - means I don't feel guilty spending too much on something I don't know how much I'll use. Oh, the items look wonderful so far! You're so lucky in the UK! 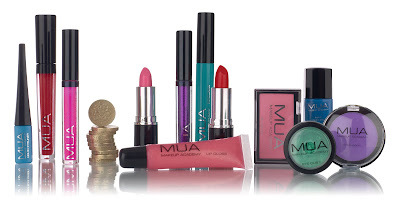 MUA £1 Makeup range is now available to buy online at superdrug.com/page/muamakeupacademy. Hurry Whilst stocks last!